What a week in Michigan politics! The litigating has begun on the state’s new right-to-work law, keeping the controversy alive, in the media, and in the public eye. There’s a right-to-work case in a lower court as well, but Governor Snyder asked the Michigan Supreme Court to make some key rulings so state employees can start dropping out of their unions as soon as the end of March. Meanwhile, some Republicans decided now is a great time to try and make changes to how Michigan apportions its Electoral College votes; those 16 votes that last year helped put President Obama over the top for a second term. The proposal is part of a national movement to make blue states less so in future presidential elections. It does address a real frustration among people who live in a state that’s very blue or red, that their votes don’t really count in presidential races. So the Republican idea is to change how the votes are counted. Instead of giving all the state’s electoral votes to one candidate or the other, they would be apportioned by congressional district, with a bonus for whichever candidate wins the most districts; in 2012 that would have likely given Mitt Romney more electoral votes in Michigan than Barack Obama, even though more Michiganders voted for Obama. But, Republican state House Speaker Jase Bolger thinks it’s “worth a discussion.” Which, if you’re looking at recent history – a la right-to-work – would seem the proposal might just remain “on the agenda.” Because when Jase Bolger talks, the Legislature listens. Looking ahead, the field of Democrats that could face Governor Snyder in 2014, or whomever the Republican nominee ends up being (we’re guessing it’s going to be Snyder) is down by one. State Senate Democratic leader Gretchen Whitmer, widely seen as the frontrunner to challenge Snyder, dropped out of the gubernatorial race this week, before she was even officially in. In an email and web-video released mid-week, Whitmer said she needed to focus her time on her two young daughters and her work in the state Senate. So who’s still out there? Many are looking at former Congressman Mark Schauer and state Board of Education President John Austin, both of whom are making some early moves toward a run. Congressman Gary Peters’ name is floating around. And, some Democrats are hoping Mike Duggan, a long-time problem solver in Southeast Michigan, will reconsider his bid for Detroit mayor to run for governor. No signs of that, though. Lansing Mayor Virg Bernero could decide he wants a rematch with One Tough Nerd. But first, he’s got to be reelected as mayor in November of this year. Democrats and Republicans choose their state party chairs in just about three weeks. Republican Chairman Bobby Schostak faces a challenge from Tea Partier Todd Courser. He ran unsuccessfully last year for the state Board of Education. Republican state conventions have become such wild, unpredictable affairs that we’re not ruling out anything. But the real donnybrook seems to be shaping up in the race for Michigan Democratic Party chair. Mark Brewer is the longest-serving state party chair in the nation – 18 years. And he wants two more years. But United Auto Workers President Bob King wants him out. And in Michigan Democratic politics, the UAW is the tail that wags the dog. Or at least it has been for a long time. Brewer is building a coalition of other groups and party leaders, who are maybe hoping to become bigger voices in the party. But the “Dump Brewer” movement also seems to have the support of much, maybe most, of the state’s Democrats in Congress. A lot of the controversy continues to swirl around who should be held responsible for the Democratic underperformance in last November’s election: Ballot questions that failed. Passage of right-to-work, Democrats failing to win control of the state House even though President Obama won the state by nine points. Some say that’s the fault of Bob King and other labor leaders and that Brewer’s being made a scapegoat. Others say Brewer’s been in long enough, that everybody knows his playbook. And, a challenger to Brewer seems to have emerged in Lon Johnson, an unsuccessful candidate for a state House seat in northern Michigan. He’s largely unknown by the public, but he has a lot of ties across the Democratic spectrum. He worked for John Dingell. He’s married to Julianna Smoot, a former fundraiser for President Obama. Most Democrats are hoping this gets settled before the February convention, and a messy floor fight. But we’re kind of hoping it doesn’t… because what a show that would be! Today on It’s Just Politics, it’s all about the politics of wildlife. Or, wildlife management that is. Okay, might sound slightly boring so, how about this: “shooting wolves.” That tends to get people worked up. In fact, groups are worked up. So worked up that they're gathering signatures right now to put a referendum on next year’s ballot to try and reverse the new state law that could clear the way for a wolf hunting season in the Upper Peninsula. We should point out this does not create a wolf-hunting season. Instead, it makes the wolf a game mammal, and allows the Michigan Natural Resources Commission to declare a wolf-hunting season if it sees a need. Opponents say it’s too soon for a wolf-hunt, that the gray wolf just came off the endangered species list last year. But there have been some problems with wolves moving into "people territory," chasing pets, getting into trash… you know, being all wolfish. Eight wolves were shot last year in Iron Mountain by wildlife officials. 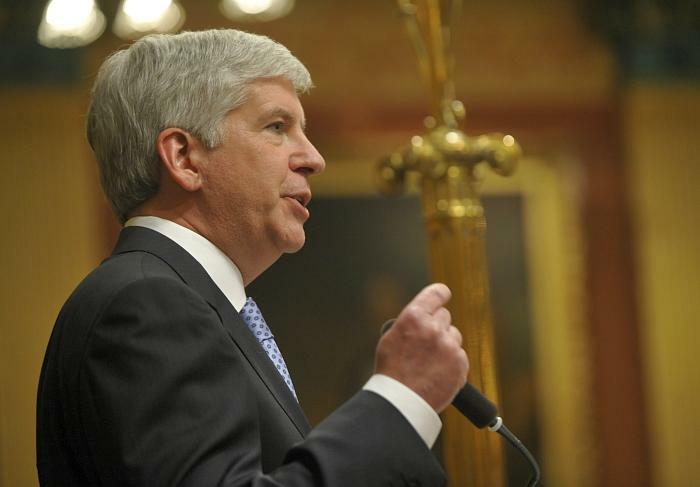 Snyder delivers his State of the State address, but is it enough to change the Lansing agenda? Governor Rick Snyder delivered his third State of the State address this past Wednesday; the annual ritual when governors defend what they’ve done over the past 12 months and lay out their vision for the coming year. It’s a night for official Lansing to step out. Some people actually buy new clothes for it. There are receptions and parties afterward, which goes largely unseen by the public, who just tune in for the speech and opposition response. That is, of course, if they tune it at all. The State of the State speech – and, nationally, the State of the Union address – is a challenge: it’s long. It’s a laundry list of policy and wonky, political-speak. It’s hard to keep people’s attention. And, we’re not just talking the TV or radio audience. It’s hard to sometimes even keep the attention of the people in the House chamber where the Governor delivers the speech. In order to try and spice things up a bit this year, Governor Snyder literally took it down a level. He delivered his address from the clerk’s perch on the dais of the state House of Representatives instead of from higher-up where the state House Speaker presides over the session. Snyder wanted to do it standing on the floor of the House, walking around with a wireless headset. No notes. Very Silicon Valley, tech company, CEO style. 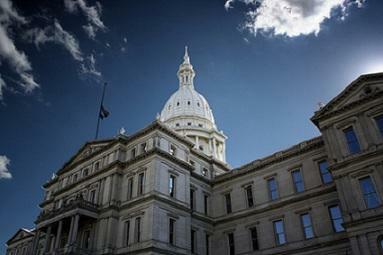 Will Republicans and Democrats play nice in Lansing in 2013? The 97th Legislature of the state of Michigan began this week, having still not shaken off the hangover of last year, as Republicans forced through controversial issues like right-to-work during last month’s lame duck session. And, it’s probably fair to say that this is more than a double-aspirin hangover. There are however, some efforts toward mending some of the very hard feelings leftover. “This past year has strained relationships,” state House Speaker Jase Bolger said on the House floor, “however, we can and should leave that past behind us.” Of course, that’s easy to say when you’re not the one still spitting the sand out of your mouth. But, Democrats and Republicans did negotiate for a peaceful opening day. Yet, Democrats and unions have made it plain that forgive and forget is not in the cards. They want the last two years, especially everything that happened in December, to be the main topic of conversation in Michigan politics for the next two years. And it certainly seemed like another thumb in their eye when the Michigan Economic Development Corporation paid for an ad in the Wall Street Journal touting Michigan as the nation’s newest right-to-work state under the banner of the very successful and super popular Pure Michigan brand. Democrats say it’s politicizing the brand and some marketing experts are even saying it might not have been the wisest choice. It’s the first It’s Just Politics of the new year and we took advantage of our sabbatical to ponder what might be the big political news in 2013. We say “might” because, well, really, who would have thought at the beginning of 2012 that our biggest political story would be Michigan becoming a right-to-work state? The biggest story out of a year already filled with intrigue, political gossip and bombshells. Certainly, there’s already intrigue afoot over how Democrats and labor are going to respond to the passage of right-to-work. It can be argued that the escalation really began in 2011. That’s when the Michigan Education Association, in particular, responded to some Republican anti-union legislation by launching a recall effort. They succeeded in recalling state Representative Paul Scott, then-chair of the state House Education Committee. Skip ahead to November 2012 and Proposal Two. Prop Two failed, and, then, voila!, Michigan the country’s 24th right-to-work state. Now, that’s just a simple version of what’s a much more complex tale. But, it does give one a sense of how politics is played here in Michigan… kinda reminds us of Sean Connery’s line in “The Untouchables." Connery: He pulls a knife. You pull a gun. He sends one of yours to the hospital. You send one of his to the morgue. Unions and progressives could try to challenge what happened in the lame duck session on the November 2014 ballot; not just challenging right-to-work but the new emergency manager law, too. The new EM law is a rewrite of the 2011 law that voters rejected via referendum in November. The organizers of that ballot drive are now crying foul, saying the new EM law is similar to the one that voters already said "no" to. Meanwhile, Governor Snyder and legislative Republicans made it impossible for voters to repeal this new EM law. We’ve talked about this often on It’s Just Politics: lawmakers can make it impossible for voters to repeal a law by adding money – appropriations – into the measure. Voters cannot repeal legislation with money in it. So, lawmakers added appropriations to the emergency manager and the right-to-work laws. But, that doesn’t mean opponents still can’t go to the ballot. Governor Rick Snyder held a year-end roundtable with reporters today. That’s on top of the public bill-signings and one-on-one interviews and meet-ups he’s held with various reporters and editorial boards in the past few weeks. These meetings are a December staple of the Lansing political-journalism culture. But, today’s additional roundtable with reporters raises the question: after hours and hours already spent being interviewed, why is the Governor holding yet another meeting with the press? A likely answer: The governor wants to reset the conversation, at least a little, and shift some attention from controversies like Michigan’s new right-to-work law and his veto of concealed weapons legislation to some good news stories – or, at least, what he calls good news stories.